Here is the first part of our Taiwan Itinerary! After a few months of planning for our Taiwan trip, we finally kicked off our trip with endless fun and food! We had so much fun and filled our stomach with A LOT of delicious food. If you’re planning to go on a free and easy trip to Taiwan, do not miss out on our travel guide! Let’s kick start our first day in Taiwan. Our Taiwan itinerary is considered a bit packed for 8D7N. The itinerary can also be stretched out to 9D8N or 10D9N if you have flexibility. If you do plan to follow our Taiwan itinerary, you may wish to adjust the pace accordingly and we would advise which places are worth going and which you may skip. This time, we decided to fly with Jetstar for our Taiwan trip. We bought the air tickets during Jetstar’s 1-for-1 promotion. We paid S$436 for a return trip for both of us including checked baggage. As for our hotel booking, we booked most of our hotels for this Taiwan trip through Agoda. The currency exchange rate for TWD during our travelling period was actually pretty bad. Please note that the exchange rates in Taiwan are better than most other countries. For us, we exchanged some at a money changer in Singapore’s Chinatown and exchanged more on our arrival in Taiwan. The rate in Taiwan was better by about 1-3%. If you can read Chinese, you may download the 銀行即時匯率(android) app on your phone to check the real time currency exchange rate at all the banks in Taiwan. Taiwan Itinerary – Where To Exchange Taiwan Dollars? In Taiwan, currency exchange can be done at the banks and money changing outlets run by the banks. Except for certain department stores, you can hardly encounter private licensed money changers in Taiwan. The best place to exchange Taiwan dollar is at the banks in Taoyuan International Airport. There’s a processing fee of NT$30. But if you take into account of the rate difference, it is still worthwhile to do it at Taiwan Airport rather than in your home country. Based on the above app, the bank that offers best exchange rate for converting Singapore Dollars to Taiwan Dollars is DBS bank. For other currencies, do check the app for the bank with the best rates. For the Singaporeans unfortunately, there’s no DBS bank in Taoyuan International Airport. You can find other banks like Bank of Taiwan and Mega International Commercial Bank in the airport. The currency exchange service is available 24 hours. See here for their locations. You may try to exchange Taiwan dollar at banks at other locations in Taiwan, but bear in mind that many other banks don’t accept SGD. Otherwise, you can also use your ATM card (if it has the Cirrus or Maestro logo) to withdraw Taiwan dollars. 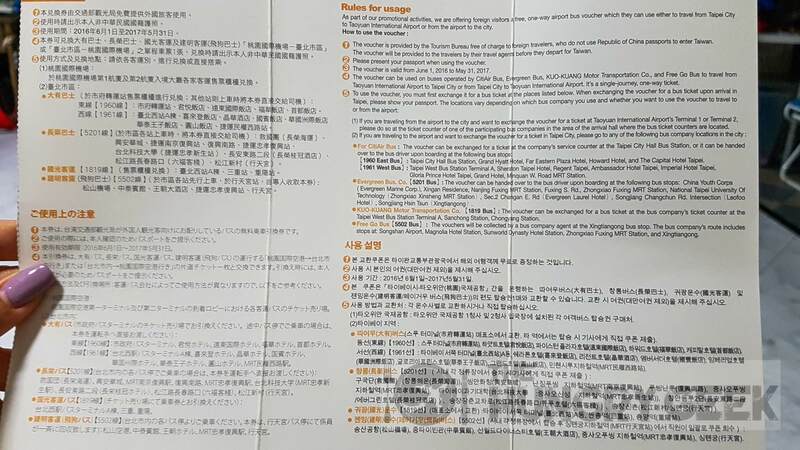 Taiwan Itinerary Day 1 – Which SIM Card To buy In Taiwan? We arrived at Taoyuan International Airport around noon. To our surprise, the queues at the immigration counters were incredibly long and we took around 45 minutes to clear the immigration. Upon the exit of the immigration hall, we were greeted with booths of Taiwan mobile service providers. We purchased a prepaid SIM card from Chunghwa Telecom (中華電信). They are the largest telecom company in Taiwan and the coverage seems to be slightly better than the rest. We chose Package E – 10 Day Pass with unlimited data + airtime worth NT$100. This package is just nice to cover our 8-days stay in Taiwan and it only costs NT$500. The Taoyuan International Airport Access MRT System (the subway) is scheduled to begin the service during the first few months of 2017. From then on, you can take MRT from Taoyuan International Airport to Taipei Main Station and Zhongli district. The estimated journey time is only 35 minutes! If you are in Taiwan before the MRT subway system is ready, taking a bus from Taoyuan International Airport to Taipei Main Station is the best solution. The journey takes around 55 minutes. [Update March 18, 2017]: The Taoyuan International Airport Access MRT System has officially launched on March 2, 2017. You may now take the MRT from the airport straight to Taipei Main Station! For more information about the service and special offers (limited period), see HERE. To take the bus from Taoyuan airport to Taipei Main Station, head to B1 Arrivals in Terminal 1 or the northeast arcade of the 1st floor Arrivals lobby in Terminal 2. We took Kuo-kuang bus number 1819 to Taipei Main Station. The bus intervals are around 15-20 minutes. For more information about airport bus services, see HERE. For more information about Taoyuan International Airport Access MRT System, see HERE. Taiwan Itinerary Day 1 – Where To Get Freebies Before Travelling To Taiwan? For those who reside in Singapore, here’s a tip for you! Before you travel to Taiwan, you can get some freebies from Taiwan Visitors Association at Chevron House. They are giving out different freebies from time to time. The freebies range from theme parks discount vouchers, attractions entry tickets to airport transfers. We brought some of them home! To avoid disappointment, do give them a call to check for the available freebies before heading down! You may check out their Facebook Page as well. You will need to bring your identity card together with your flight details or hotel bookings for redemption of the free gifts. We got the one-way airport transfer and a free fruit picking tour package as our freebies! The bus dropped us at the bus station near Taipei Main Station, Exit East 3 (東3出口). The temperature in Taipei was 22 degrees celsius that day, but we felt much colder than that due to the chilly wind and there was a drizzle of rain! Taipei Main Station is really huge! There are several department stores that branch off in different directions from the center of the station. As soon as we reached Taipei Main Station, we went to collect our train tickets to Hualien at the ticket counter. If you are buying train tickets online, you will have to collect the tickets in advance at the ticket counter. More details about buying train tickets online will be covered in an upcoming post! Stay tuned. There’s a LINE FRIENDS store at Breeze, Taipei Main Station! So many cutesy stuffed toys and accessories available here! Before we head to Ximending to try some delicious street food, we dropped off our luggage at our hotel near Taipei Main Station. Morwing Hotel is where we will be staying from day 5 to day 8, but not tonight. We were told that we could leave our luggage under their care as well even on the days where we would not be staying the night. We are going to take the train to Hualien tonight after exploring at Ximending and trying the famous Michelin-starred original Din Tai Fung branch in Taipei. Do I even have to mention that this is a MUST GO place in Taipei? Do make sure to insert this into your Taiwan itinerary! Ximending – the famous shopping district in Taipei, is not just popular among tourists but also a place where the youngsters in Taipei are clustered. Trendy fashion, delicious food and all kinds of entertainment can be found here. Ximending has just too much to offer. You must at least try some of the street food here! There is a lot of street food around this happening district. So please remember to spare some space in your stomach when you visit. For a list of food to hunt for, see our main food article for Ximending – What To Eat At Ximending. First place to go to — Ah Zong Mian Xian! This alley is full of good food! O.M.G. Would you buy this? The landmark of Ximending. But too bad it was under renovation during our visit, the building was being covered up. We almost got fooled by the facade! See HERE for our detailed review of food that we had at Ximending! Our first dinner in Taiwan was at the original branch of Michelin starred Din Tai Fung (Xinyi Road). As expected, the restaurant was extremely crowded. Just what so special about this place where the famous Din Tai Fung originate? We have a special write-up coming soon! Like our Facebook page and follow our Instagram to see more of our new posts coming up. Eating and drinking are allowed on both HSR and TRA trains. It is a common sight to see people purchasing lunch boxes or snacks to eat on the train. If you feel hungry during the journey, you can also buy from the food carts on the train. To travel from Taipei to Hualien, the fastest way is to take the train by TRA. We bought the fastest class of train – Puyuma Express operated by Tze-Chiang Limited Express. The journey takes around 2 hours and each adult ticket costs NT$440. The train tickets can be purchased online around two weeks in advance. One thing to bear in mind is, the train travelling between Taipei and Hualien is quite popular so I would recommend that you buy the tickets immediately the moment that they are available for booking. I will post a step by step tutorial on buying train tickets online, please stay tuned. Both HSR and TRA trains are usually on time. The TRA train tickets you buy online need to be collected at least 30 minutes before the scheduled departure time. So to play safe, do remember to reach the train station earlier! If you plan to visit Hualien at the beginning of your trip in Taiwan, I would recommend that you spend at least a night in Taipei before heading to Hualien. It was a little bit too rushed and tiring to take train from Taipei to Hualien on the same day as we touched down Taipei. But due to our packed schedule, we had to do so. Once again, I would like to emphasize that our 8D7N Taiwan itinerary is considered pretty packed because our priority is to visit as many places as we can. So if you prefer to plan a more relaxing trip, we recommend you to stretch our 8D7N Taiwan itinerary to 9D8N or 10D9N! Upon reaching the Hualien train station at around 10pm, we took a taxi from the train station to Hotel Bayview, our hotel choice in Hualien. Hotel Bayview provides complimentary pick up service from the train station to the hotel up till 8pm. But our arrival time was too late for that. The 15-minute taxi ride cost around NT$200. After the long day, we could finally have a good rest. After researching the hotels by the Chishingtan beach, Hotel Bayview came up as our first choice. Hotel Bayview is really beautiful and it is situated right beside the famous Chishingtan scenic area. That’s all for our first day in Taipei! On the next day, we will be heading to one of the most popular attractions in Taiwan – Taroko Gorge, as well as Hehuanshan and Wuling. If you would like to see more posts like this, please like our Facebook page and follow our Instagram to keep yourself updated. We will be sharing more about Taiwan itinerary and the good food we had here! ← Kumoya – Delicious Food at a Hip Japanese Cafe! What To Eat at Taipei Ximending 西门町 In "Taiwan Street Food"
Hong Kong Trip Nov 2015 – HK Day 1 Itinerary In "Hong Kong Itineraries"
7 Comments on "Taiwan Itinerary Day 1 – Taiwan 8D7N | Taipei – Ximending – Hualien"
Hi, did you have to pre-order your SIM card or just show up at the counter and buy it? Hi there ! I am really impressed with your plan and this complete blog. Very well done ! It is definitely very useful to me. I am planning for a 10-day trip in Mid June but i have crunch now planning the first half of they trip as I would like to keep the last half in Taipei. I hope to cover Taipei/Nantou/Cingjing/Hualien in this trip. My 1st day arriving Taoyuan is around 5pm. In your opinion, where should i continue from there ? direct to Hualien or Taichung or Nantou ? Hi, I would recommend that you spend the first night in Taipei so that you won’t be too tired. Then the next day you can take train to Hualien or HSR to Taichung. You may choose to go by Hualien -> Cingjing (via Taroko Gorge & Hehuanshan) -> Nantou -> Taichung -> Taipei OR Taichung -> Nantou -> Cingjing -> Hualien (via Taroko Gorge & Hehuanshan) -> Taipei. Hi, the money changer counters at the airport are pretty obvious. You can easily find them at the arrival hall. Hi Sheryn, can pls advise how to book train tickets to go Hualien from Taipei Main Station? We either go on 5 or 6 January 2018. Can buy tickets early? How early? Is 2 wks earlier (mid Dec 2017) too late to buy? Am concerned if peak period.